I left the local Atlanta Bread Company after again having lunch there (I had the chopstix chicken salad - minus tomatoes - and baked potato soup in a half-and-half). 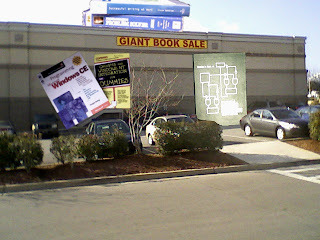 As usual, the building across the parking-lot street had the "Giant Book Sale" sign on it (this building used to be a Tweeter audio/video store, but they closed a while back). Anyway, I'd been wondering, for quite a while, "Where are all the giant books?" I'd even been inside the store once, but no giant books. But today, when I came out of ABC, there they were - and apparently they had too many to fit in the store! Giant books everywhere! It was rather an amazing sight. Click on the picture to see a larger version. If I'd been in the mood, perhaps I'd have taken another look at the giant books for sale, but unfortunately I had to get back to work. I did snap this picture before leaving, though. Oh, and I don't think the giant books would have fit in my trunk, so it's probably a good thing that I didn't get anything. I didn't have my stash of bungee cords to tie a book to the roof of the car, so I wouldn't have had any way to get my purchase home. Anyway, if you live in the Huntsville/Madison area of North Alabama, wander over to University Drive (AKA US-72), towards the Madison end of town (i.e., west from Huntsville), and you'll see the giant book sale* (it's in the parking lot of the Target shopping center), and stop in to ABC for some lunch or dinner. Just remember to bring your truck if you plan on purchasing any giant books. Just fyi, we closed January 27th. The sale moves on, South Carolina, I believe. Good luck with your endeavors! I think you've been in Huntsville before, over where Service Merchandise (or something) used to be. I did buy some stuff when there was a book sale there. If that wasn't your group, sorry. So... "doc_sax" - are you a fellow saxophonian? I also find it somewhat interesting that you managed to find this blog post.